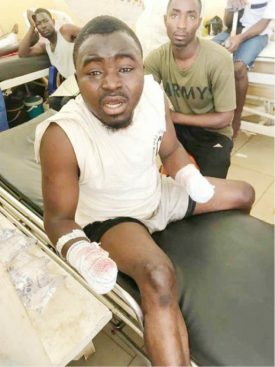 Governor of Sokoto state, Aminu Tambuwal has assured that suspected hoodlums who chopped off the hands of a 200 Level English Student of Usmanu Danfodio University Sokoto Habibu Abubakar Nakasari will be arrested and prosecuted. Naija News also reports that the attackers have been arrested by the Police. The state Police Command Public Relations Officer, Sadiq Abubakar Mohammed confirmed the arrest. Tambuwal gave the assurance when he visited the victim at Orthopaedic Hospital Wamakko, where he is on admission. Speaking, Deputy Governor Hon. Maniru Muhammad Dan’iya who represented his boss said: “The Governor mandated me to come and visit you and your family to assure you that all hands are on deck to arrest and prosecute the perpetrators as enshrined by law”. Dan’iya disclosed that Governor Tambuwal had directed that the State Government take full settlements of all medical bills of the victim. He prayed Almighty Allah to push out the perpetrators of the evil act soon.